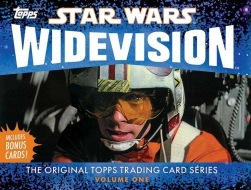 Following the successful release of multi-series trading cards based on the original Star Wars film series (1977–83), Topps released the first volume of its Widevision series in 1995. These special cards were just as tall as the standard Topps trading cards but twice as long—a format that better reflected the widescreen dimensions of the films. Now, for the first time, every card, as well as rare promotional cards and limited edition chase cards, are reprinted in one deluxe collection. This new volume includes the fronts and backs of each card, showcasing original storyboards, fun facts, filmmaker quotes, behind-the-scenes photos, and exclusive commentary by George Lucas. Also included are four bonus cards, rare promotional images, an introduction by Gary Gerani, the original editor of the Star Wars Topps series, and an afterword by Star Wars collector Stephen J. Sansweet.